The Sea Sprite 30, built by Rhode Island’s C. E. Ryder Co., may be easily overlooked by sailors unfamiliar with the model or the builder, but this small cruiser offers traditional style, good cruising accommodations for her size, well above-average quality, and perhaps a bargain price. 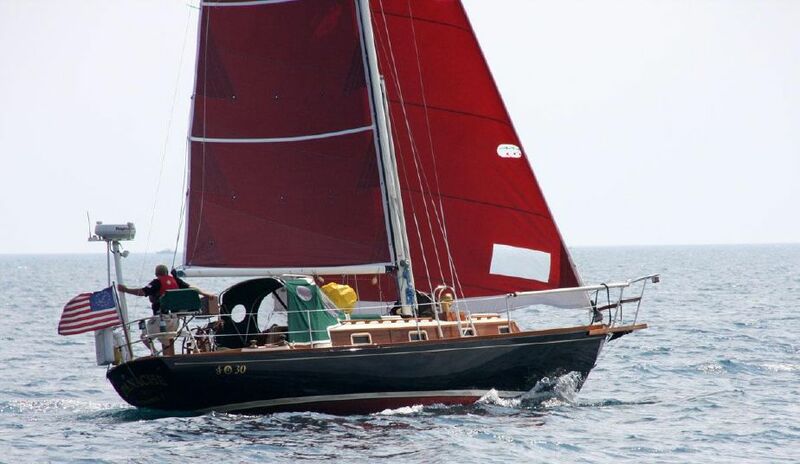 Many sailors are more familiar with Ryder’s Gilmer-designed Southern Cross series of double-ended cruisers introduced at the 1975 Annapolis Sailboat Show than with their Sea Sprite series. Actually, Ryder began building its Sea Sprite series a year earlier when it took over production of the Carl Alberg-designed Sea Sprite 23 in 1974. Following the success of the Sea Sprite 23, the 28-foot, 30-foot, and 34-foot models were subsequently introduced, and all remained in production until 1986. Although sometimes confused on the water with similar Alberg-designed Cape Dory models, the Sea Sprite 28, 30, and 34 models were all designed by Alfred “Bill” Luders (1909-1999). The Sea Sprite 30 shares nearly identical overall and waterline lengths with the Cape Dory 30. However, she has a slightly higher freeboard, is six inches wider, and is most easily distinguished by her 7/8 fractional rig as compared to Cape Dory’s masthead cutter rig. I suspect some Cape Dory owners will argue, but I believe another distinguishing factor is that the Sea Sprite 30 is a step above the Cape Dory in quality of construction. Unique for a production boatbuilder of the early 1980s, Sea Sprite hulls are constructed with Airex, a PVC foam core between inner and outer laminates of fiberglass cloth and polyester resin. The result is a stiff, yet strong and relatively light hull. The deck is also a cored composite built with a Balsa rather than Airex core for its superior properties in this application. The interior structures are all wood with no fiberglass pans or liners for structural support. Several construction features I feel set the Sea Sprite 30 apart from her competition include fillets at the attachment of bulkheads to spread the loads and prevent hard spots, bulkheads that are attached to both the hull and deck, a hull-to-deck joint that is bolted on six-inch centers, and stainless steel chainplates bolted to structural members that better distribute rigging loads. On deck, my favorite feature is the teak toe rail that is twice as large as those found on other boats of this size. If you don’t like it for its rugged looks alone, you’re sure to appreciate it the first time you ever have to make a headsail change in nasty weather. Teak handrails, cockpit combings, dorade boxes, and an “eyebrow” above the cabin ports all contribute to the traditional, yacht-like appearance, but do add to the maintenance chores. All bronze ports also add to the look, with the added advantage that they don’t wear out after 10 to 15 years of service. The cockpit is comfortable, as wheel steering is standard equipment, and there is plenty of readily accessible storage in port and starboard seat lockers and a small lazarette. Down below, the arrangement is simple and proven to work for more than 50 years. A V-berth cabin forward is followed by a port head and starboard hanging locker. There are mirror image settees in the main saloon and a galley aft separated by the companionway. Eight opening ports and two deck hatches provide good ventilation. And, with a displacement of 10,000 pounds, there is plenty of volume for good storage and 55 gallons of potable water in two tanks. An abundance of solid and laminated teak joinery is offset by light colors to avoid a dark interior. Auxiliary power was provided by a freshwater-cooled, two-cylinder Universal Marine diesel engine which, at 3600 RPM, produces a rather anemic 11+ horsepower. This is adequate for most days on the Chesapeake Bay or coastal cruising, but a 10,000-pound boat needs 18 to 20 horsepower for severe conditions or serious bluewater cruising. Luders is perhaps best regarded as a designer for his successful 5.5-meter racing sloops, so it stands to reason that he would know a thing or two about designing relatively heavy boats that sail well. It seems he did. With a displacement length ratio of 419 and a sail area/displacement ratio of 14.65, the Sea Sprite 30 was heavy even by early 1980s standards, but she has proven to be quite responsive even in light to moderate winds. Let it blow 15 knots or more, and the advantages of a 41-percent ballast/displacement ratio, a fractional rig, and a tapered mast become apparent in her stiff and stable performance. With a 22-foot waterline and rather long overhangs, she does tend to hobbyhorse in short choppy seas, and it becomes more important to keep excess weight out of the ends. As of November 1, three Sea Sprite 30s were offered for sale at Yachtworld.com with an average asking price of $37,300, while the average of the last four reported sales was $35,700. For comparison, the last four reported sales of early 1890s Cape Dory 30s averaged $31,750, and the last three reported sales of Morris Yacht’s 29 Annie model, from the same era, averaged $64,600. While I’ll admit that the Sea Sprite 30 doesn’t enjoy the same reputation of an Annie, and perhaps may not be quite up to the quality, she’s not far behind, and I believe offers excellent value for anyone looking for a capable cruiser in this size range.